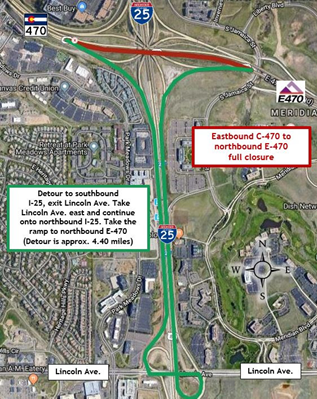 DOUGLAS COUNTY—For the second consecutive night, crews will close eastbound C-470 to northbound E-470 (at the C-470/E-470 interchange) to continue making emergency repairs to a safety device damaged during the weekend storm. Work will take place from 11 tonight, Tuesday, Nov. 13 through 1 a.m. Wednesday, Nov. 14. Crews will have a detour in place. Please watch for detour signs.